NOTE – Many thanks to Aaron N9SKN and Cliff WA9YXG, who pointed out errors in the schematics. They have been corrected, and N9SKN has built a working Sproutie from the schematics in this post so rest assured that if you follow them, you can too. If you’re thinking about building this great little general coverage regen, I’d urge you not to print out any of this article to work from. The reason is that whenever I make an improvement or addition to this receiver, I edit this article. By working from a printout, you’ll be missing out on any changes I subsequently make. Having said that, The Sproutie works fine as is, so don’t be scared off from building it. I saved my pennies and eventually sent off for the H.A.C. Model DX Mk. 2. It wasn’t as fancy-looking as the one picitured in the ad, as it didn’t have a front panel or a calibrated dial but hey – those kinds of regens were only for the truly well-heeled, and I was just a kid with a modest allowance. The kit that arrived used an HL23DD valve (or equivalent). 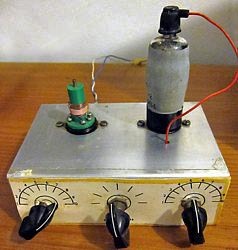 It was a battery operated double diode triode, with a coated filament, to maximize emission on the low filament voltage of just 1.5V (2V maximum, with a current consumption of just 50mA). This set didn’t have a front panel or a calibrated dial, sporting just a modestly-sized aluminum chassis with 3 chicken head knobs on the front, but with my 2000 ohm headset and 90V high tension battery, I truly was the king of the shortwave hill. I don’t have any pictures of my H.A.C. Model DX Mk. 2, but featured here are pictures of someone else’s taken from Louis Muelstee’s great website, which is where the ad shown above came from too. Truth be told, this wasn’t exactly the most sensitive receiver ever created, but it mattered little to a teenager in England in the 1970’s, with plenty of loud shortwave broadcast signals. There was much to keep those high impedance headphones firmly glued to my head. They were fairly cheap quality, and the way the metal headband tensioned the earpieces against my ears made them a little red after 30 minutes of use. Did I care? Not at all – I wore them for hours on end, as I was enthralled by the sounds of Radio Nederland, Radio Prague, Radio Tirana Albania, Radio Moscow, The BBC World Service and many other broadcasters, as well as all the weird-sounding utility stations and the very mysterious numbers station from East Germany. I had no idea back then what it was, but the female voice announcing strings of numbers in German was strangely compelling. Every day, I would rush home from school, eager to get into my bedroom, plug the low-tension battery in, wait for a short while for the tube filament to heat up, then connect the high tension battery and clamp the headphones to my head, cup of tea by my side, as another listening session began. Weekends were heaven. As soon as all my homework was out of the way, there was nothing but blissful hours and hours of potential shortwave listening time stretching ahead. 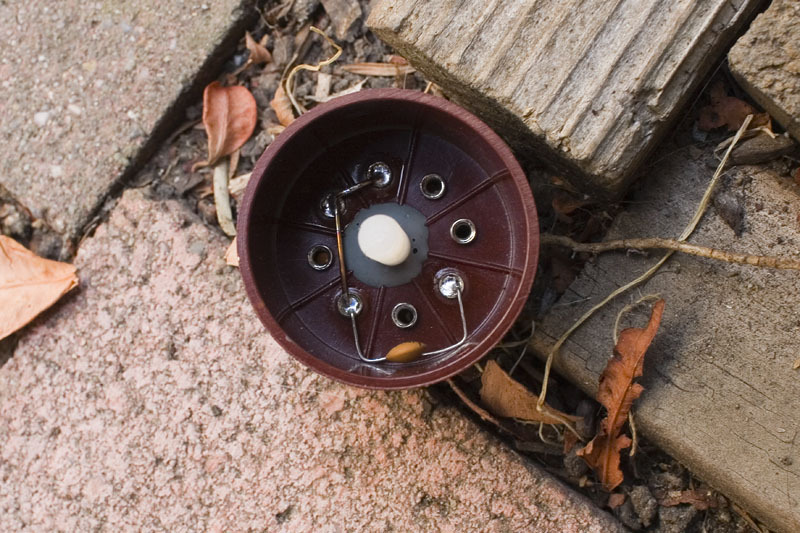 From time to time, the 90V battery would run down, and I would walk the 2 miles into the village of Astwood Bank to buy a new one from the local gas station. It didn’t take me long to figure out how to power the filament from a transformer in order to save money on low tension batteries. I eventually figured out how to do the same for the high tension supply too. On good days, I could even pick up some local amateurs on 80M SSB. Man, I was indeed the king of the shortwave hill! At the back of my mind, though, was the idea that somewhere out there was still a truly dreamy shortwave receiver – one that had a front panel fashioned from a sheet of aluminum, and a calibrated tuning dial. It only took me until the age of 50 to finally own one of those only-in-your-dreams kind of receivers. Which is what this blog-post is all about. Charles Kitchin had a design for a receiver which caught my attention. It was published in the Feb 2010 edition of CQ Magazine and consisted of an oscillating detector feeding a 2-stage amplifier consisting of a low-noise FET-input opamp acting as the preamp. The preamp had a low-pass filter with a variable cut-off point, as well as an extra capacitor in the audio chain that could be switched in to give a nice lift to the lower frequencies, for those times when you have a nice strong signal and want a bit of bass boost. This preamp drives an LM380, which makes for a much lower noise AF amp chain than the default in these types of receivers that employ an LM386. On top of that, there is provision for a line out jack for recording. 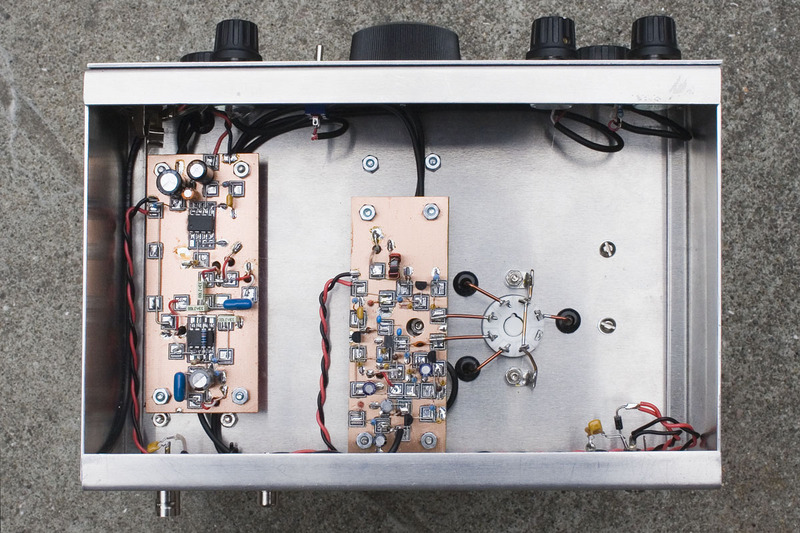 I was interested – regardless of the front end I used, this could definitely be the AF amp for a “serious” regen! 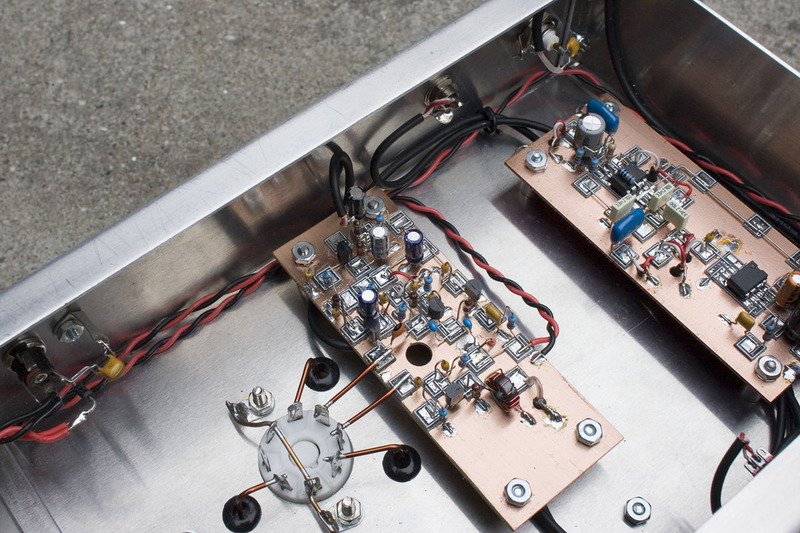 Before I had even fully decided on the finer details of this project, I assembled the AF amp on a separate board. I wanted this to be a somewhat modular receiver, with the AF and RF sections built on different boards so that if either section didn’t work out, I could try a different one. I wasn’t entirely convinced that the value of Hammarlund tuning capacitor that I was planning on using was going to be ideal, so I wanted it to be a relatively easily swappable part with other tuning capacitors of different value but with the same form factor (of which I own a few). If I was going to go to the trouble of building something like this on a nice chassis, I wanted to give myself the maximum possible chance of succeeding. In Chuck’s original version, the 2.2K resistor on the input was 5K. The ratio of this value to the value of the 100K resistor between pins 2 and 6 of the AD820AN determine the gain of the stage, and I wanted a bit more. Also, the LM380 was motorboating when the AF gain pot was set to anything higher than half-volume, so I added the 10 ohm resistor in the supply line and bypassed it with a 470uF electrolytic, which stabilized it nicely. The +ve supply line was connected directly to pin 7 of the AD820AN, but this could also be bypassed if necessary. A series 100 ohm resistor with a 47uF or 100uF bypassing to ground should work nicely. You can also sprinkle a few large decoupling electrolytics in the range of 100 – 470uF at various points on the 12V bus directly to ground. A small issue I experienced was that when the AF gain pot was at absolute maximum volume, rotating the low-pass filter pot caused clicks and “bloops” in the speaker. It seemed to only happen when the slider of the pot had finished traveling over the carbon track and had actually made contact with the metal that formed the hot end of the control. 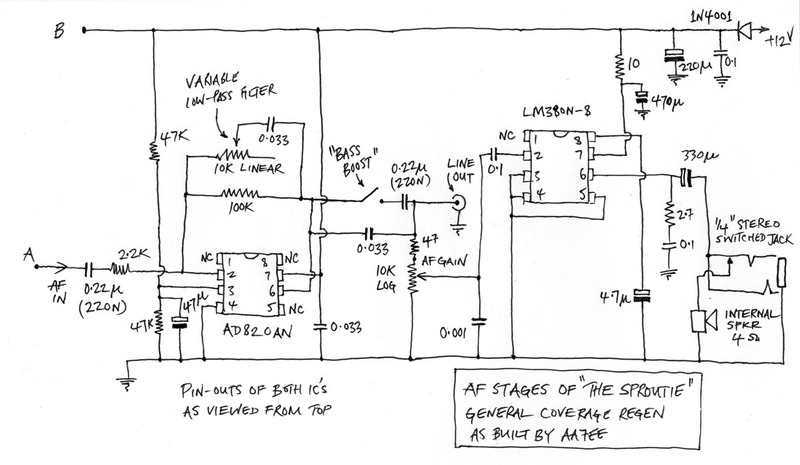 A 47 ohm resistor placed at the hot end of the 10K AF gain pot provided the necessary isolation (this is shown in the schematic), and I was left with a volume control that operated smoothly, and a variable low-pass filter pot that also operated smoothly. I also added a 0.1uF coupling capacitor on the input (pin 2) of the LM380. 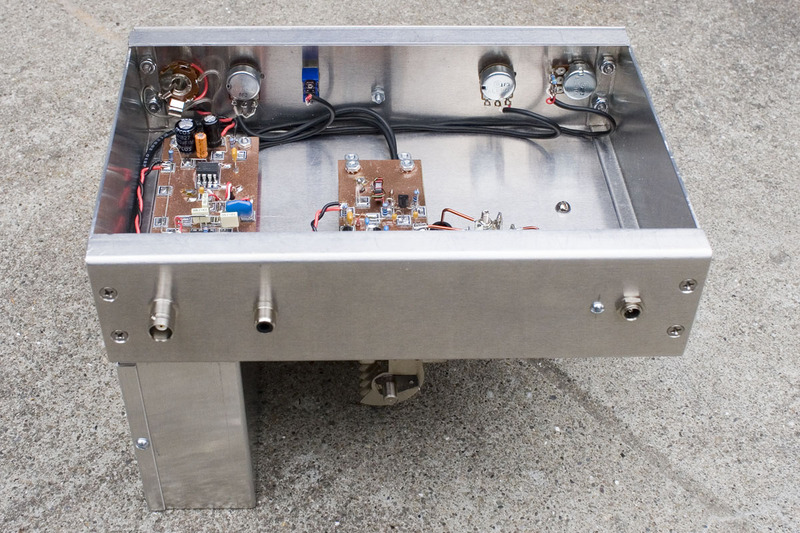 The 0.1 and 220uF bypass capacitors on the 12V line were placed so as to bypass the 12V supply directly at the point of entry into the chassis. They were soldered directly on the back of the DC power connector and grounded with a solder tag bolted to the chassis. The 1N4001 diode was also placed at the same point. The front end is a very standard design. It is the same configuration (and indeed the same circuit) as used in the WBR, with the exception that the tank (unlike that in the WBR) is unbalanced. This same arrangement was used in Nicky’s TRF, as featured in issue 70 of SPRAT, and I believe the original circuit was developed by GI3XZM. I wanted this receiver to be usable over a wide range of frequencies, and in keeping with my “modular” approach, wanted the receiver to be as versatile as possible. 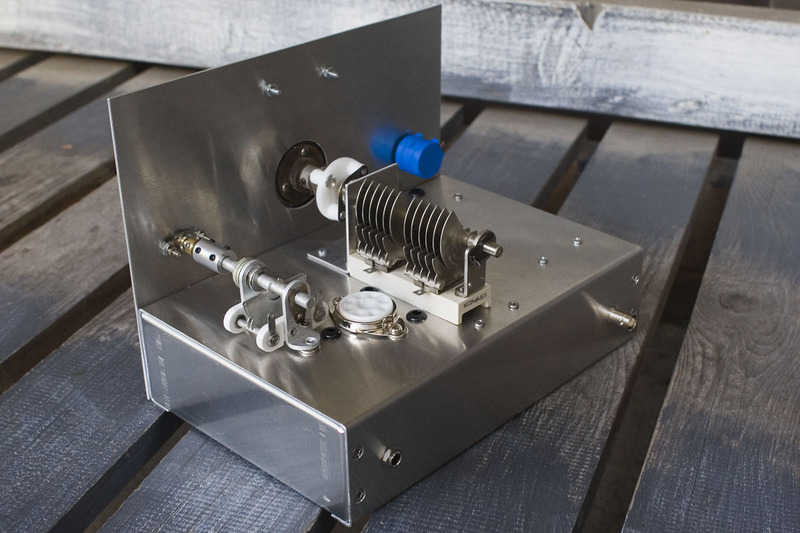 A plug-in coil system, with both gangs of a dual gang variable capacitor, as well as the fine tuning capacitor, all available at the pins of the coil base, allows for a lot of flexibility when winding coils for different bands. The user decides, when constructing a plug-in coil, whether to include parallel or series capacitors for the main tuning and fine tuning capacitors, as well as choosing whether to use one, or both gangs of the tuning capacitor. In this way, with some calculations and a bit of trial and error you could, say, wind a coil to cover a large segment of the HF spectrum, or a single narrow band of frequencies. If, after some listening, I decide one day that I am particularly interested in the 16M broadcast band, I can construct a coil to cover just that one band. Neat! The J310’s in the RF amp and the detector stage could be any similar N-channel JFET such as the MPF102 or the 2N3819. Likewise, the two 2N3904’s could be most any small signal general purpose NPN transistor. I originally fed the output of the J310 “infinite impedance” detector stage directly into the input of the AF amp board, but quickly discovered that the gain wasn’t enough to comfortably drive a loudspeaker. Had I done a few quick calculations beforehand, I would have realized that. I wanted to take advantage of the fact that the output chip is an LM380, by driving it enough to make a loud noise into the speaker! Adding the single 2N3904 preamp stage after the detector solved the problem nicely. I have built enough of these simple receivers that can drive “a small speaker to a comfortable volume in a quiet room” 🙂 No more! As with any circuit of this type, the RF stages, and the frequency-determining part of the circuit especially, should be built with short leads, and stiff wiring. Top quality components will help. The two 330pF capacitors in the feedback circuit of the 2N3904 oscillator stage should be NPO’s (or C0G’s – same thing), as should the 39pF capacitor. The coils were wound on toroids, and the coil assemblies mounted in octal tube bases. I spent a great deal of time on W8DIZ’ site, using his online calculators to figure out the number of turns required for varying degrees of coverage. Unless you build a receiver with the same variable capacitors, and use a very similar physical layout, you’ll need to do your own calculations, and then be prepared to tweak the final values of inductance and capacitance to get the coverage you want. Incidentally, I used a Hammarlund MCD-35-MX dual gang component for the main tuning capacitor. It was this one that I got a deal on over a year ago. The official specs say that each section has a capacitance of 6 – 31pF, but I also had to make a rough estimate of the stray and circuit capacitance when calculating the required values of inductance and capacitance to cover each band. 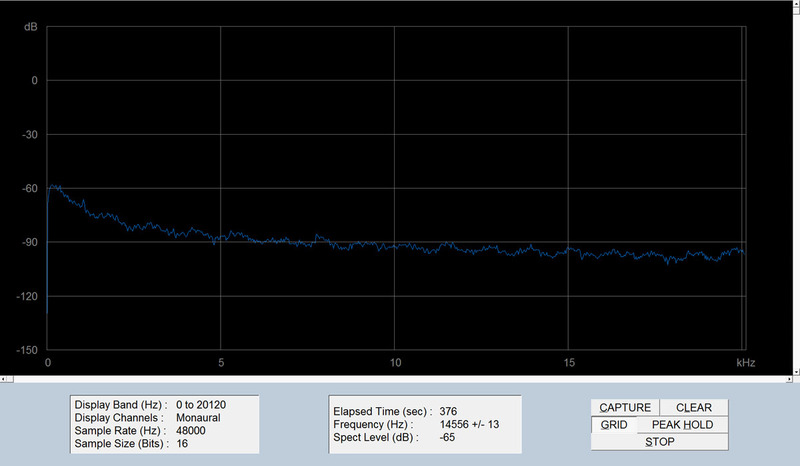 My fine tuning cap was a Hammarlund MC-20-S, and I had to include the capacitance of that in the calculations too. This is the online calculator on W8DIZ’s site for the T68-6 core. He has similar calculators for all the popular toroids. Very useful stuff. Note – for some reason, the calculator doesn’t always estimate the correct length of wire that needs to be used. This is easy to work around. Just wind one turn around a toroid measure it’s length, multiply that by the number of turns, and add a few extra inches for good luck (and pigtails). Here are the details of the coils wound so far, including the temporary “experimental” coil for 24-29MHz. I didn’t get as far as installing a link winding for this coil, but the main coil was picking up plenty of signal from the proximity of pin 7 of the tube socket to the coil. I have been very pleasantly surprised at how sensitive and stable the set is at these higher frequencies. Soon after winding it, I copied SSB on the 12M and 10M amateur bands, as well as plenty of over-modulated and very loud local signals on 27MHz 🙂 Unless you also use the same values of tuning and fine-tuning variable capacitors, and closely copy my layout, your values will be different, but here is the info on my coil set so far. After a little while spent looking at it, it should make sense. Once you get used to figuring out how to wind a coil for a specific set of frequencies, it’s fun. I have 15 coils so far, with ideas for a few more. 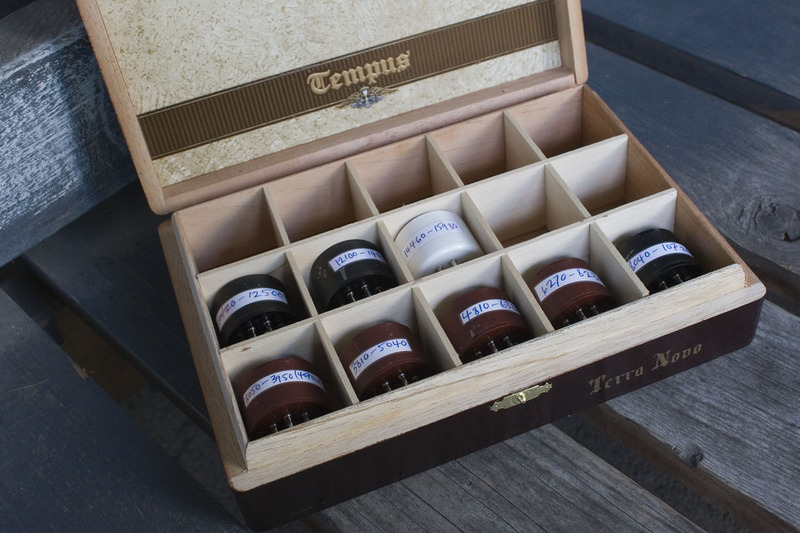 I have already filled up my cigar box coil box, and am getting ready to make a second coil box and wind a few more coils. One of the really enjoyable things about a regen with plug-in coils is making coils for new bands. Fun! If you wind too many turns for the link winding, you may find that you have to turn the regeneration control nearly all the way clockwise in order to reach oscillation, or you may not be able to reach it at all, as the link winding loads down the oscillator. It is particularly easy to do this on the higher frequency bands. If this occurs, remove a turn or two from the link winding. In operation, it is easy to overload the detector (as it is with all regenerative receivers). I use my Sproutie with a large outdoor antenna and find that on the lower bands, I usually only need to operate the set with the RF “gain” control set halfway. 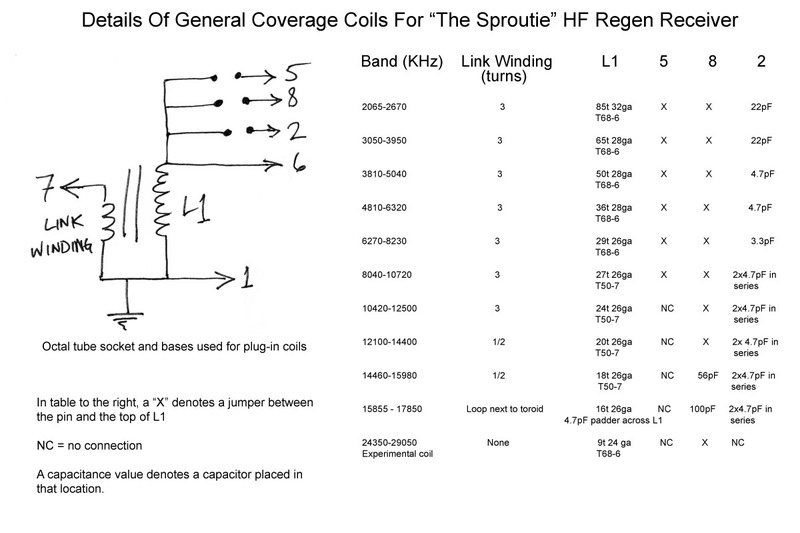 The 15855 – 17850khZ coil stops about 50KHz short of the top of the 16M band, which is nominally 17480 – 17900KHz. However, all these coverage figures are quoted with the fine tuning control set to maximum capacitance. With the fine tuning control, I can tune all the way up to 17900KHz with that coil plugged in. With the first set of coils I wound for specific bands, I was using significant values of fixed capacitance across L1 in order to reduce the frequency swing caused by adjustment of the main tuning capacitor. I noticed after a while that these specific band coils weren’t giving such good sensitivity as the general coverage coils. I have since discovered that it is best to avoid large values of parallel fixed capacitance, as this seems reduce the performance. Adding a capacitor of a few pF to tweak the coverage is fine, but large values (of the order of 50 or 100pF) will reduce performance. If you want to reduce the frequency swing to cover a narrow band, best to achieve it with the use of a capacitor in series with the main tuning capacitor instead. The performance of the coils in this receiver seems to be maximized by using as much inductance and as little capacitance as possible. This is more noticeable on the higher frequency bands. The coil for the 16M BC and 17M ham bands. This one covers 17400 – 18200KHz. Adding capacitance across the coil will bring the overall frequency down, and limit the range of frequencies that the main tuning capacitor will cover (as the tuning capacitor is now just part of the overall capacitance across the coil). However, if you place too much capacitance across the coil, the circuit will not oscillate. When making estimates and performing calculations, remember to include the capacitance introduced by the circuit, and stray capacitances. Another strategy for limiting the range of frequencies the tuning capacitor covers is to put a capacitor in series with it (the tuning capacitor). If I haven’t already mentioned it, the online calculators on W8DIZ’s site are great for figuring out resonant frequencies for tuned circuits involving toroids. The calculator for the T50-7 is here, and the menu to the left of the page has links for the pages for each of the other toroid cores. Each page also tells you what range of frequencies that particular material is good for. However, even after you think you’ve figured out what values you need for the inductor and capacitors, whether you’re going to use padders, series caps etc, you’ll most likely still have to do some tweaking of values until you get the coverage for each coil that you want, based on observation and experimentation. Once you’ve got the exact values you want, make sure to hot-glue the toroid to the tube base. If you don’t do that, you’ll experience instability and microphony. It’s amazing what difference a couple of dollops of hot glue will make! For the chassis, I first looked at what was available in off-the-shelf sizes and couldn’t find anything that fitted the bill. 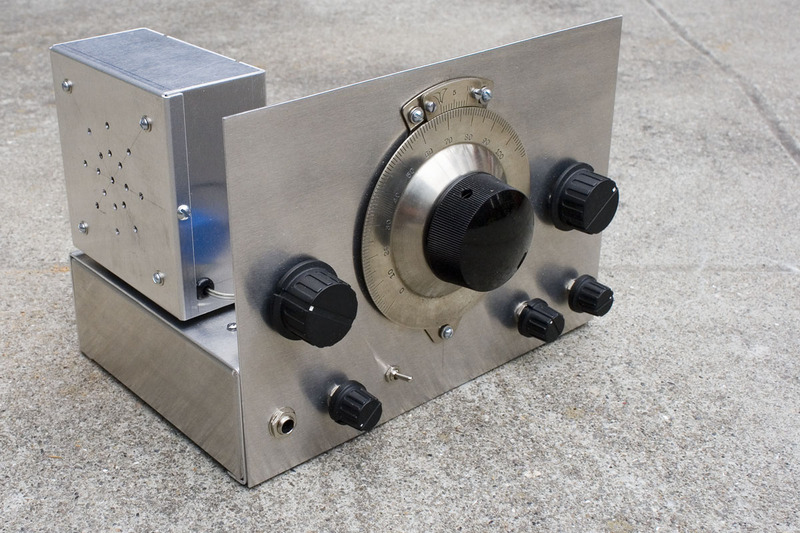 Hammond have a good selection of different sizes, but their enclosures, for the most part, use 0.04″ thick aluminum. I wanted something thicker, for a very sturdy structure, so I decided to look into having a custom chassis made. 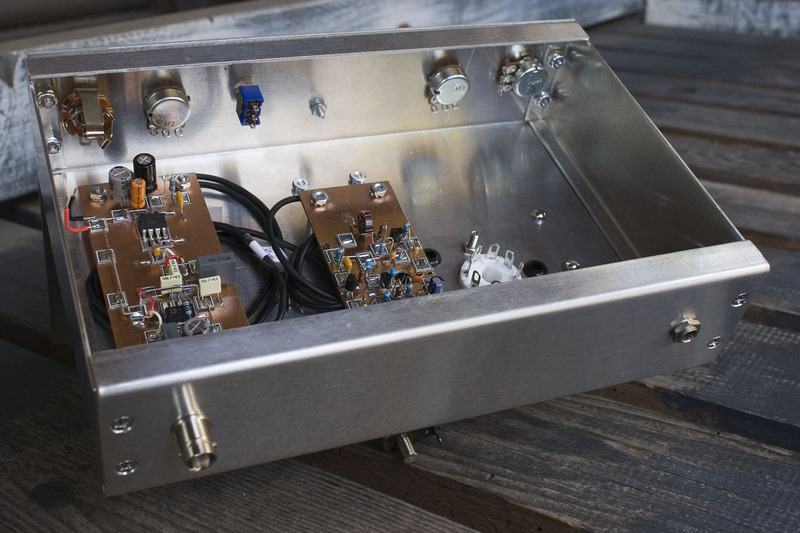 A bit of searching turned up two businesses that manufacture aluminum chassis’ for homebrew tube amp enthusiasts – Dirty Dawg Amps, a US based business who are temporarily out of business due to a fire, and Seaside Chassis Design, who are located in Novia Scotia. 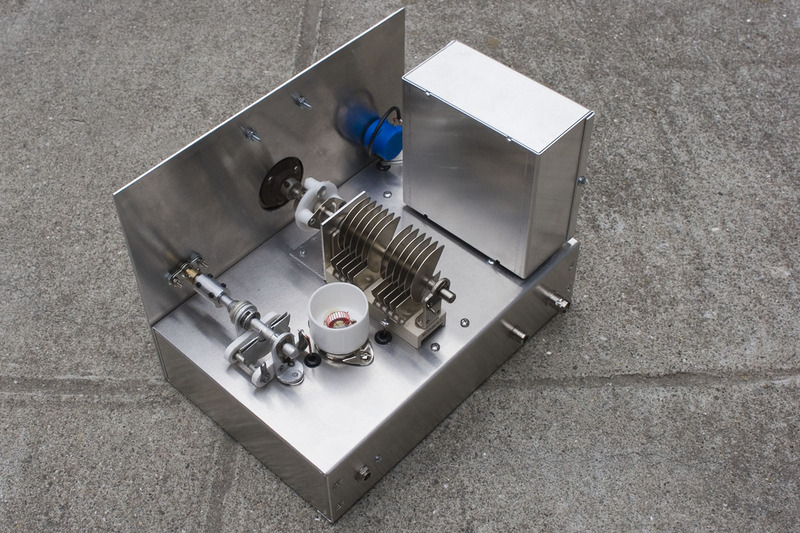 Seaside Chassis use a minimum of 14 gauge aluminum for their enclosures. 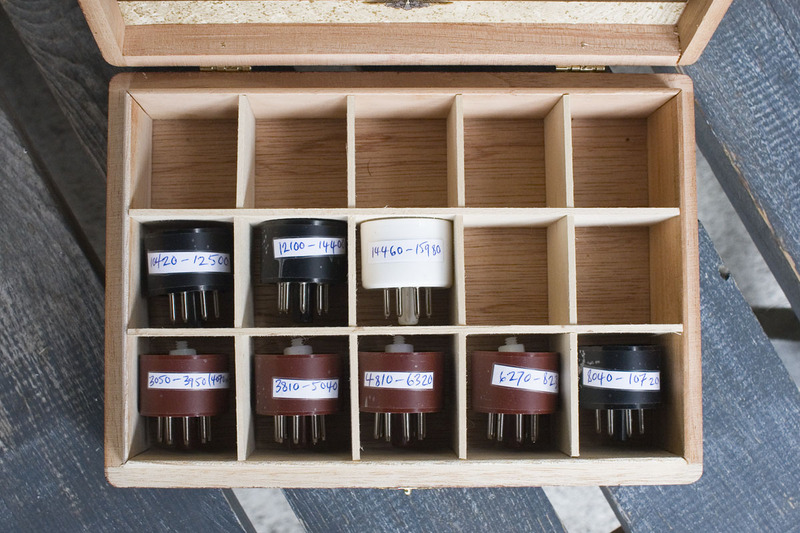 14 gauge is about 0.064″, which I knew would make for a nice stout case. Terry was very communicative and straightforward via e-mail about what he could do and what it would cost. I sent him rough drawings, with dimensions, of the chassis, front panel, and mounting bracket for the main variable capacitor that I was hoping he would be able to fabricate. He was able to make all 3 items and on top of that, he would punch all the main holes for me, leaving me just to drill the smaller holes for mounting screws. 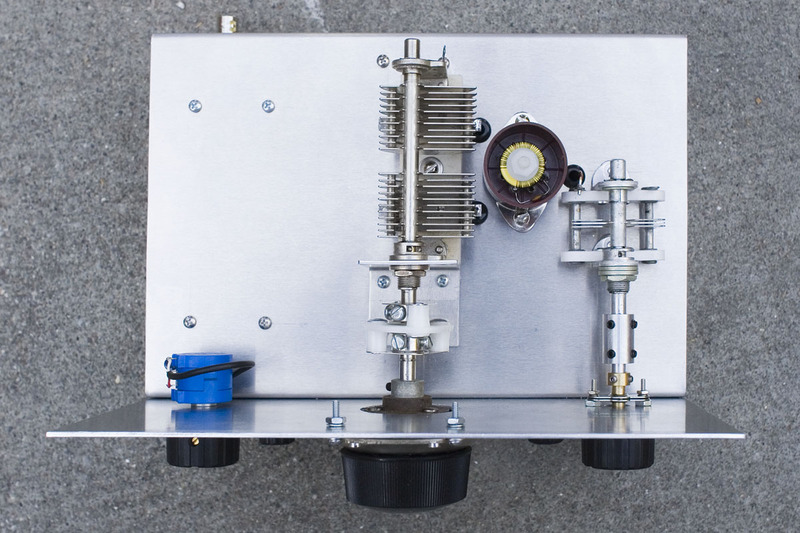 This was great news, knowing that I would shortly have a solid and well-made chassis on which to build this receiver. I dropped the ball somewhat and didn’t take a picture of the chassis when it arrived, but here’s what it looked like with all the main components fitted, before wiring it all up. The 2 biggest factors in making this receiver look so grand are the National “N” dial with Velvet Vernier drive, and the excellent chassis. Does this look inspiring or what? The controls on the upper row are, from left to right – regeneration, the main tuning knob, and the fine tuning. On the lower row, also from left to right is the headphone socket, RF attenuation, the bass boost switch (down = more bass) , the low-pass filter cut-off control, and the AF gain control. 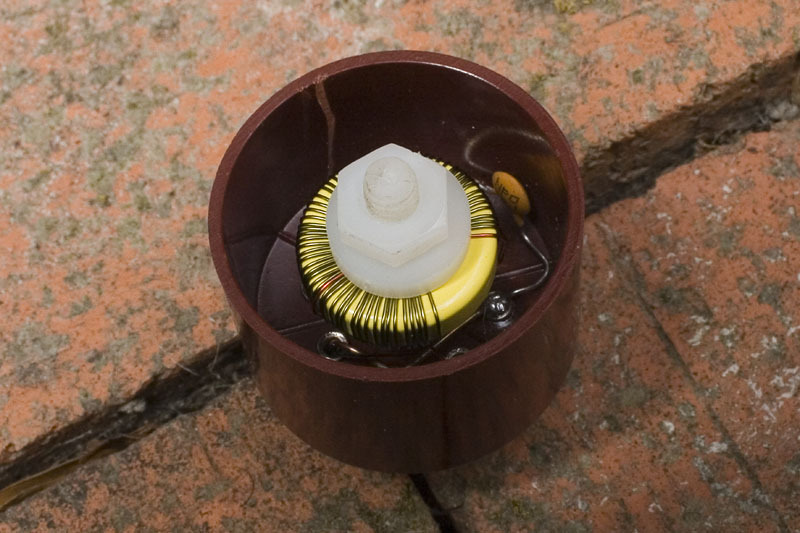 I was initially concerned that the 5:1 reduction ratio of the National drive wasn’t going to be high enough for accurate tuning on the HF bands – it was a good part of the reason why I chose the value of the main tuning capacitor and wound the coils so as to limit the tuning ranges to around 2MHz or less. This approach results in more coils, but really helps in creating a regen that can be set to a particular frequency, and from which you can read the frequency (with the help of a calibration graph – more on that later.) This receiver can be set to within a few KHz of any frequency. This is good enough for finding a particular SW AM broadcast station. I can also read the dial setting and then consult my custom calibration graph to find what frequency I am on to within a few KHz. It’s not much by modern standards, but is pretty good for a regen with an analog dial. The National “N” Dial is marked from 0 to 100 and thanks to the vernier scale located at the top, it can be read to one-tenth of a point. These dials, when in good condition, have a firm yet smooth action with no backlash that makes tuning a receiver like this a good experience. Another thing to note is that these dials were manufactured with CW (clockwise) and CCW (counter-clockwise) characteristics, meaning that as you rotate the dial clockwise, the numbers either go up (CW type) or down (CCW type). This makes sense when you consider that variable capacitors were made as units that either increased in capacity as you rotated the spindle clockwise, meaning that the frequency went down (CCW type), or as units that decreased in capacity as the spindle was rotated clockwise, meaning that the frequency went up (CW type). The latter type is the convention for variable capacitors today. When we rotate our tuning knobs clockwise, we expect the frequency to increase. Back in the days when our predecessors thought more in terms of wavelength, they would have expected wavelength (instead of frequency) to go up with a clockwise rotation of the knob. This particular regen uses a CCW-type variable capacitor, so I married it up with a CCW-type vernier dial. It does take a while to get used to the fact that the frequency goes down when you turn the tuning knob clockwise, but I am beginning to adjust. There seem to be quite a lot of these lovely old National “N” dials around, if you take the time to look. A fellow homebrewer told me that his local electronics surplus store had a number of them in good condition for a very good price (I believe he bought them all!) Hamfests and swapmeets are also a good place to look. eBay is another possibility but the prices asked are a bit on the high side, in my opinion. I got mine from Gary at Play Things Of Past. He was easy to deal with. 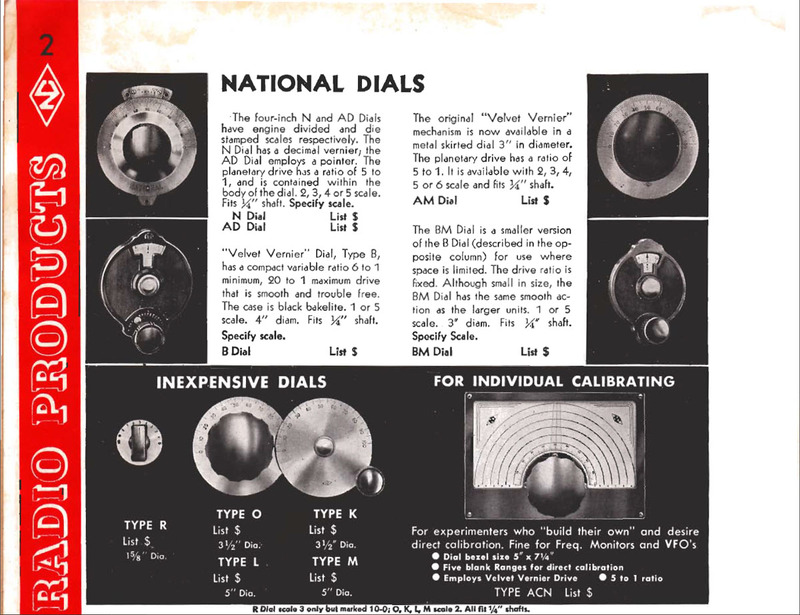 Note – the National N dials have 3 small rubber/fiber bumpers installed on the mounting plate to prevent the front metal “flange” (the part with the engraved dial markings) scraping on it when the dial is turned. If your dial is in good condition, none of the main parts are bent, and everything is running “true”, you can remove these bumpers. I did, and the result was a dial that rotated very smoothly. With the bumpers in place, there is a very slight scraping sound as the dial is turned. If you do this, make sure to save the bumpers in case you later wish to re-install them. The variable capacitor I used is what Hammarlund called a “midline” type in which the moving plates (the rotor) were mounted off-center so that the relationship between degrees of rotation and the resulting capacitance was non-linear. The intent was to keep the relationship between degrees of rotation and frequency fairly linear and by looking at the graph, you can see that it is not bad at all. I also found that once a graph was plotted, I was able to set the dial and return to a particular frequency with a good degree of accuracy and repeatability. When listening to AM stations with this receiver and it’s bandwidth, which is of the order of 10KHz, you can be assured of returning to a dial setting and hearing the station you want. 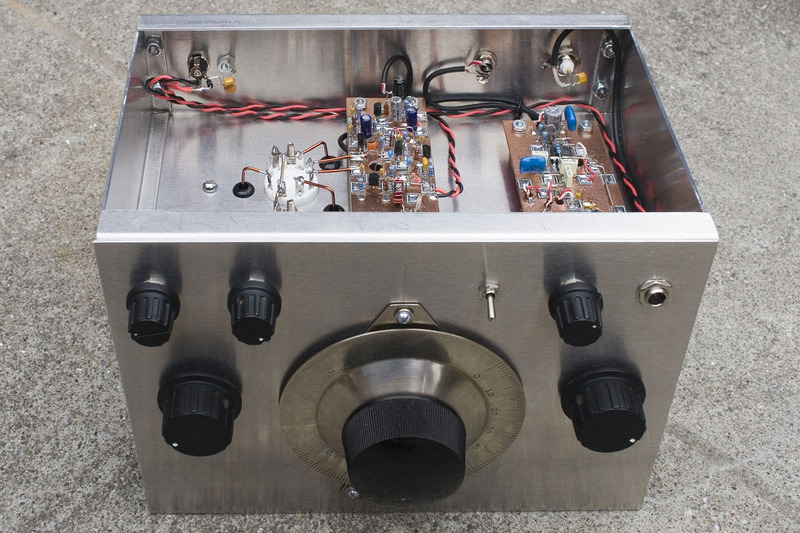 The Sproutie does work on SSB and CW, but SSB reception is trickier due to the need to control the signal input level (with the RF attenuation/gain pot) in order to prevent overloading of the regen detector and pulling of the oscillator, and to adjust the level of regeneration in order to inject the right amount of carrier. If the signal level to the regen stage is too high, the oscillator will pull, resulting in the signal sounding “wobbly” due to FM’ing of the oscillator. This happens very easily, even with moderately strong signals. My preferred method of operating the set when listening to SSB stations is to run the AF gain at, or close to, maximum volume, and to keep the RF “gain” low. Sometimes, I need to keep the RF gain twisted almost to zero in order to achieve a nice stable demodulated signal. When adjusted properly, SSB sounds good on The Sproutie, but it takes a fair bit more work than with a superhet fitted with a product detector. 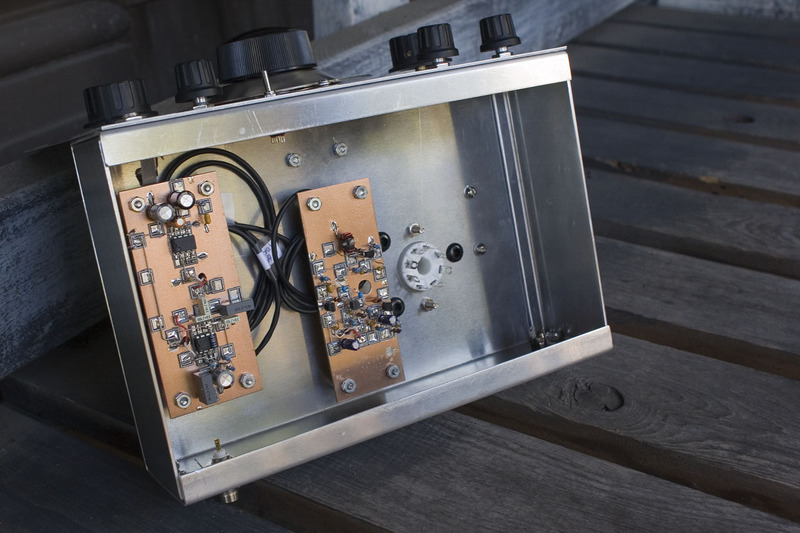 Hams and shortwave listeners who have used older superhets that used BFO injection into a receiver with a diode detector will be familiar with the technique of keeping the AF gain up high, and using the RF gain to control the signal-to-carrier injection ratio. In this case, we are also using the RF gain to prevent the detector from being overloaded and pulling the oscillator. Sound tricky? If you’ve never done it before, it can take time to get used to, but after a while, it becomes almost second nature. While I’m on the subject of fine tuning, allow me to expound a little more on reduction drives. In contrast to the friction drive on the National “N” Dial I used for the main tuning, the reduction drive on my fine tuning is a Jackson Bros 10:1 ball drive which has a small amount of backlash and feels a bit “spongy”. I don’t like it, and am grateful that for my main intended use of listening to AM stations, I won’t need it. I may change this ball drive for either another friction drive, or a different ball drive. The Xtal Set Society sell 6:1 ball drives manufactured (I believe) by Oren Elliot) that have a more pleasing feel. EDIT – I have since found that making the 2 screws that hold this mini ball-drive to the front panel very, very tight seems to eliminate the backlash and reduce the spongy feel a bit. I suppose it increases the pressure on the bearings a little. For the time being, I’ll keep this drive but if I ever change the front panel, that will be the point at which I’ll drill a bigger hole for a more conventionally-sized reduction drive. For the above reasons, if I were intending to listen to more SSB and CW on this receiver, I would definitely wind coils to spread each entire amateur band over the whole rotation of the dial, and make sure I had a reduction drive for the fine tuning with very little or zero backlash and a better feel (though having said that, the regeneration control works very effectively for fine tuning). Well, it’s obviously not the kind of brick wall shape we might expect from a good crystal or mechanical filter but if you look closely, the passband is about 25dB down at the 5KHz point and 30dB down at the 10KHz point, That’s not too bad for AM reception, though if you wanted to get really serious about it, a passband of around 5 – 6KHz with a much steeper wall would, of course, be more ideal. It is important to remember that these spectrums represent the response of the entire receiver, and not just that of the front end. SSB and CW signals become higher-pitched as you tune away from the center of the signal, but although the audio frequency make-up of an AM signal tuned off-center does change, the whole signal does not become higher-pitched. Therefore, an audio filter will be more effective at rejecting off-frequency signals for SSB and CW signals than for AM. 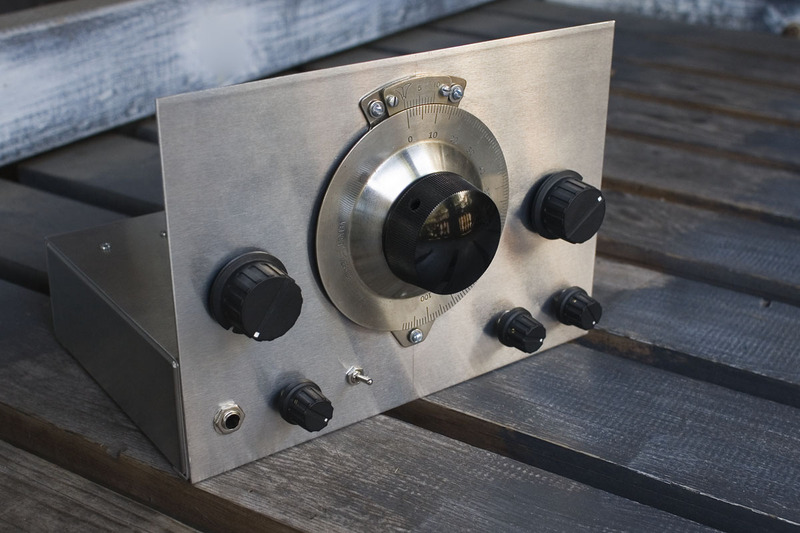 Nevertheless, the adjustable low-pass filter is very good at cutting down much of the high pitched static that can make simple receivers like this quite tiring to listen to for long periods whatever mode is being received. It makes The Sproutie feel like a “grown-up” receiver! It always feels good to build something that works, and The Sproutie certainly does that. It’s a great little receiver for shortwave listening and with an extra tube base, a toroid, some wire and a few extra capacitors, you can add whatever frequency coverage to it you like as you go along. 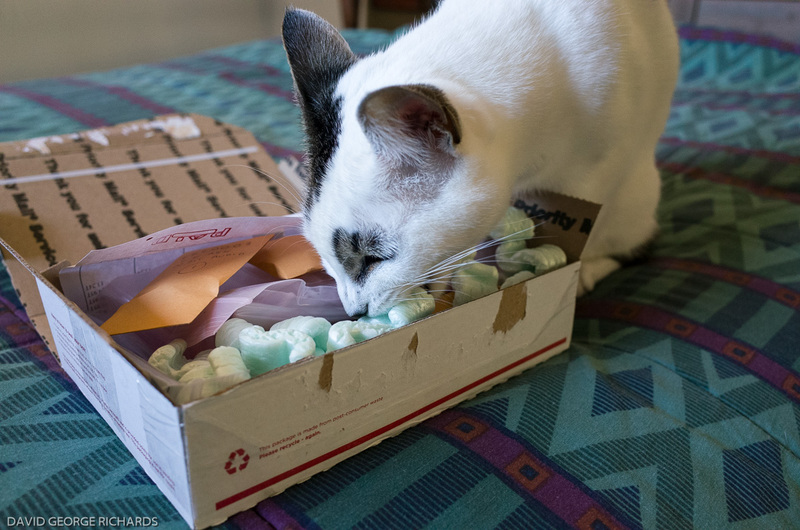 Oh – and I just realized I didn’t explain that Sproutie is the nickname I gave my 2 1/2 year-old cat Sprout, whose ham radio name is Sprat The QRP Cat. I had already named one of my home-brew radios after a kitty I used to have called Rug, so figured it was time to honor Sproutie in the same way. Videos of The Sproutie in action are here. Thoughts on using The Sproutie to receive SSB are here. 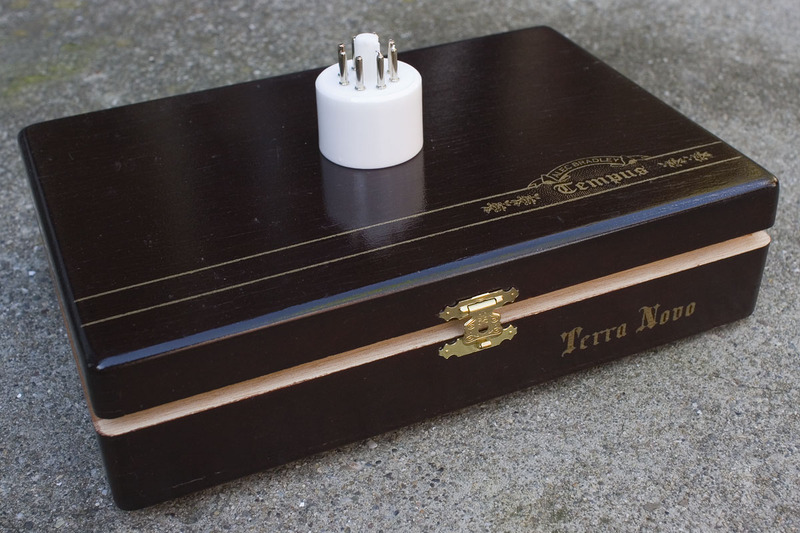 This cigar box cost $5 from a local tobacconist and makes an excellent coil box. 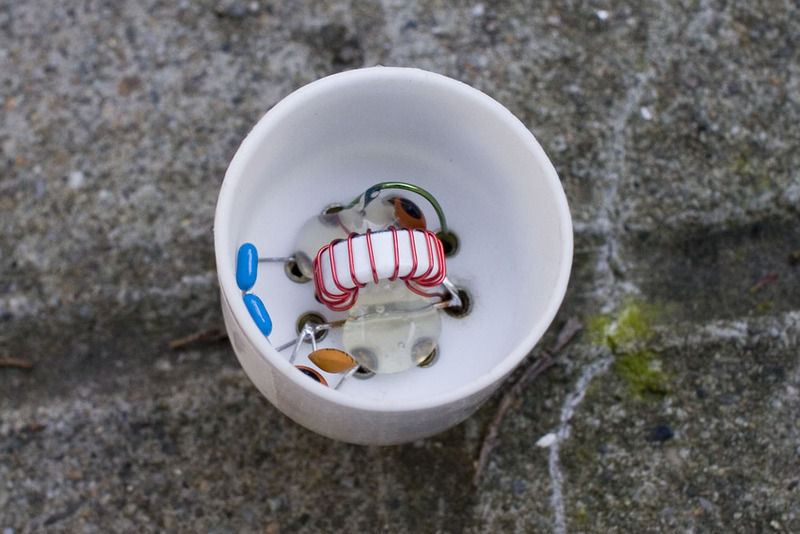 The unmarked ceramic tube base sitting on top is the experimental coil for 24-29MHz. 4 adhesive vinyl bumpers stuck to the bottom help to protect it from rough surfaces. Posted in Amateur Radio, Broadcast Radio, Ham Radio, Short Wave Listening.Tagged Charles Kitchin, Chuck Kitchin, General Coverage Regen Receiver, General Coverage Regenerative Receiver, GI3XZM, MePADS, MeSQUARES, N1TEV, National "N" dial, Nicky's TRF, Regen receiver with plug-in coils, Regenerative receiver, sproutie, The Sproutie Regen. Wow, so many memories – I too remember yearning for the HAC short wave receiver as always seen in the back of PW and Short Wave Magazine. I never owned one but did build an equivalent receiver designed by G3OGR using god Denco Plug in coils sometime in the late 1970’s. Really enjoy your posts Dave, and the wonderful photographs of your excellent craftsmanship. That is absolutely a beautiful receiver, I can’t wait to hear it. Thanks for a great blog, I always enjoy it. Would you post the dimensions of this latest project chassis you had commissioned? Hi Randy – you’re a long way from Oakland and Berkeley now! Sorry that I forgot to include the dimensions of my chassis. It is 9″ wide by 6″ deep, and the front panel is 9″ wide by 6 1/2″ tall. As you can imagine, the cost was quite a bit more than buying an off-the-shelf size Hammond chassis, but this one was made of thicker aluminum, it was made to the exact size I wanted, and Terry punched all the main holes for me too, so it was well worth it. I really wanted this receiver to be one that I can be using years from now, so it made sense to spend a bit more to have just the right chassis for the job. Indeed I am… I received my electronics ed @ Laney College! Thanks for the info. I intend to have the chassis fabricated at my place of business, collect some parts and go from there. My last project was a Manhattan version of the SW40+ . Worked out well except for the matched 4MHz xtals which I didn’t have so used some SMT 4M’s which show a LOT of attenuation. 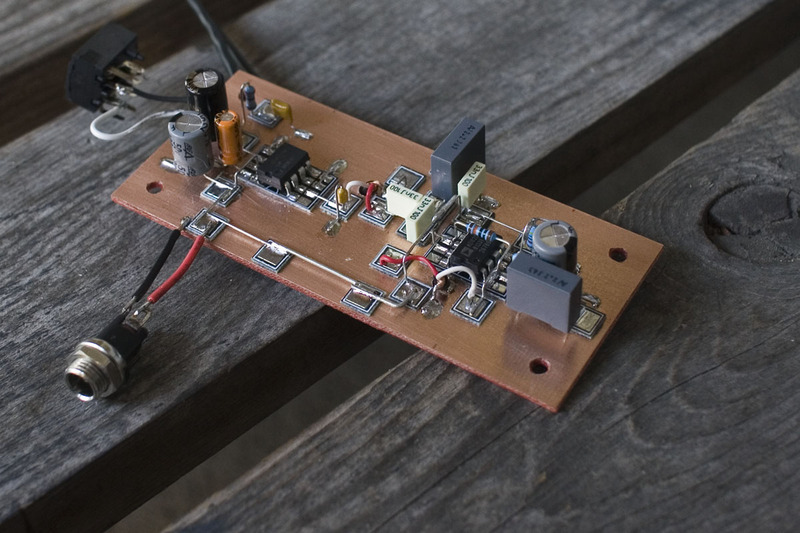 Built an RF boost circuit but haven’t tried it out as yet. I’m a hobby jumper it seems and I pursue my interest till it’s all gone, then flounder for a few weeks looking for an inspiration (hate that very uncomfortable!). Then jump all over that then rinse and repeat…. Randy – I know exactly what you mean with the changing interests. I blame it somewhat on being INTJ, if you believe those Meyers-Briggs characterizations. All I know is that my interests are very narrowly focused, and if I’m not interested in doing something, it’s almost impossible to get me to pay attention. However, once I am locked onto something, I can focus on it until I’ve reached my goal. Gosh you do good work! I’m amazed! Thanks Dan. It’s a labor of love, for sure. 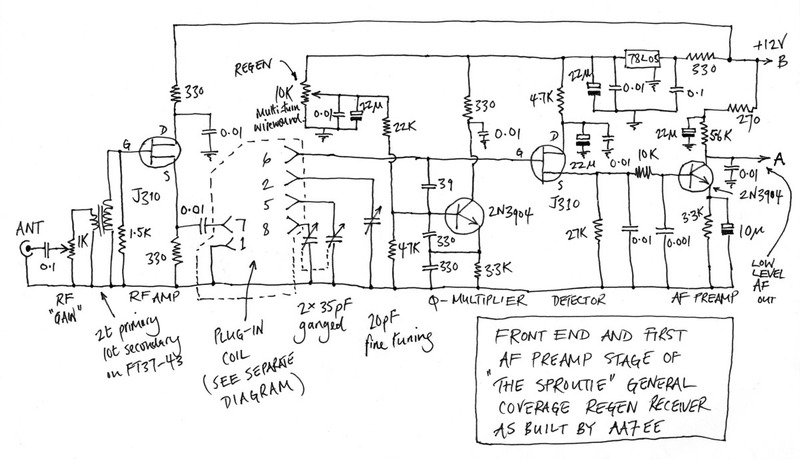 Just in case anyone is duplicating: the schematic of the “Sproutie” AF board seems to be missing the positive power connection to pin 7 of the AD820. From the pictures you can see that it should go to the little +12 power bus . Thank you very much Paul. I really appreciate the trouble you went to in order to let us know. I have changed the schematic to reflect that error. I may end up re-drawing it so that area is not as cluttered but at least now it is accurate. 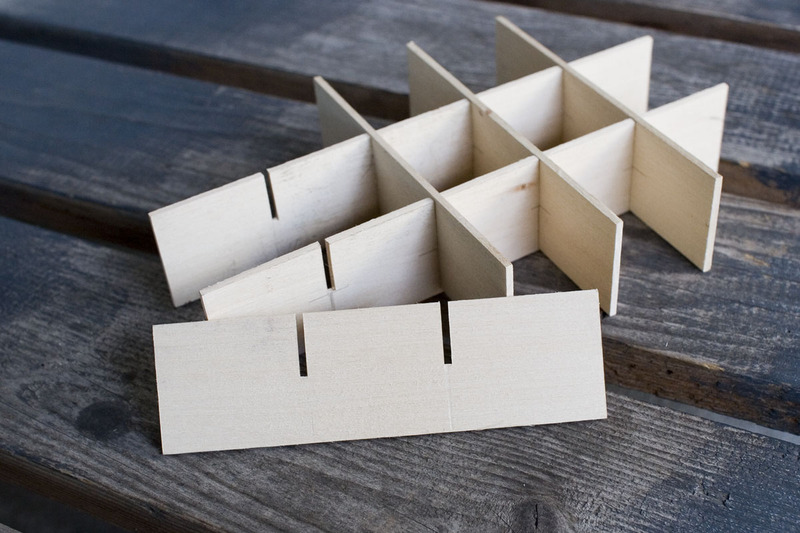 I hate to think of anyone building this and not being able to get it to work due to an error on my part. A very nice regenerative receiver with Q-Multiplying and detecting separated into two distinct stages. I see that the AF preamp stage with 2N3904 has been coupled directly onto the source of the infinitie impedance detector J310. This is not a good idea, because when the Q-Multiplier is oscillating, detection of the RF-voltage over the tank circuit will change the bias conditions of the infinite impedance detector. 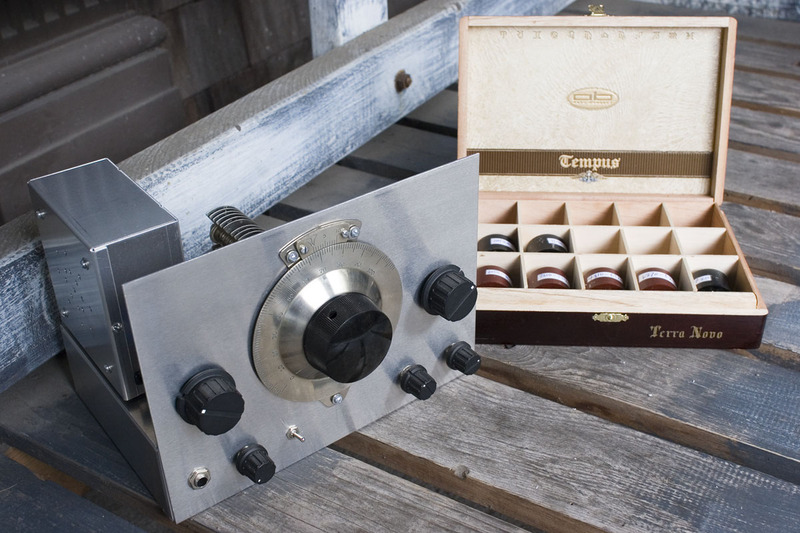 This will upset the bias of the AF preamp stage which can cause malfunctioning of that stage. A Collpits oscillator which is used here, is only suitable for a small band coverage, if you want to use this receiver for a wide bandcoverage with a tuning capacitor of 500 pF you will have to modify the Q-Multiplier into a Hartley oscillator. The Q-Multiplier’s emitter resistor of 3k3 can be made adjustable to obtain a smooth and backlash-free regen control. Thank you for that, mast.. I always appreciate it when anyone goes to the trouble to comment on the circuit of a project. Good point about the input coupling of the AF preamp. I haven’t experienced any issues, but it would be a worthwhile modification to couple those stages capacitively and bias the 2N3904 preamp separately. I believe that one or two folk were thinking of duplicating this circuit for a wider band coverage, so thank you for making the point about the oscillator. Note – I just realized that I have been using this receiver almost exclusively to listen to AM SWBC stations, so wouldn’t even notice an issue with the oscillation of the Q-multiplier affecting the operation of the infinite impedance detector. The same method of coupling is used in the WBR, however, and I didn’t notice any issues while listening on SSB, but I do see your point. Fantastic looking project, Dave! Your documentation and presentation are first class. Congratulations are in order. I was considering duplicating your project and noticed the capacitor connected from pin 7 on the plug in coils to the source of the the J310 RF amp does not have a value? You have indicated that this has been corrected on the print, but I only see pin 7 connected to ground through a .033uF cap. Could you please elaborate on this? Thanks and congratulations again. I would love to hear the Sproutie and see it in action on YouTube. Aaron – those missing items you mention (the connection from pin 7 of the AD820 to the +ve rail, and the value of the capacitor from pin7 of the plug-in coil to the source of the J310) were corrected a month or two ago. Try clearing your cache to see if your browser will upload the current schematics. Let me know if that works. If not, I can e-mail you the correct schematics, but hopefully, that should do the trick. The cap from the plug-in coil to the source of the J310 is 0.01uF, incidentally. Did you see Mast’s comments above yours? He indicates that it would be better if the source of the infinite impedance detector J310 were coupled indirectly (most likely capacitively) into the 2N3904 AF preamp. This is not going to be an issue if you are using the set to receive AM stations. I haven’t tried this set with SSB, but I used the same circuit configuration with my WBR and it does a fine job on SSB. It’s something to be aware of though. I may drag out my Sproutie to see how it performs on SSB and consider a modification if necessary. However, I can testify that it works well on SW AM broadcast stations, which is what I built it for. Please feel free to comment here more if you wish, or to e-mail me directly (I’m good on QRZ). The only video camera I have is an old one that has rather poor video quality. If you’ve seen my other videos, you’ll have an idea. However, I may make and upload a brief video using this camera. It would probably be better than nothing at all. Wonderful piece of art. Glad to see there is still people with a gift for real good and solid engineering. I must have missed this blog post a few months back when you first put it up, but just caught wind of it on YouTube. Incredible build and great write-up! The videos are great and hearing your demo of it makes me think its about time I start working on one. Never had a regen before and I think it would make a great wintertime project. A thing of beauty, Dave. I too had an HAC as a boy. I think it was for my 12th birthday in 1965. I’d been using an ex-RAF R1155 that my dad picked up in Lisle St up to then but I wanted something I could hack about with. Also, the voltages in the 1155 were a bit off-putting. It sat next to my bed, and as it had no cover, on more than one occasion I got a jolt from it. I used the HAC for ages, but eventually I replaced it with an Eddystone. Not appreciating the long-term value, sometime later I hacked the aluminium chassis apart and used it for making mounting brackets on my motorbike! All of this was for SWL’ing. I didn’t get into amateur radio until I was in the sixth form, and then didn’t get licensed until the late 70’s. There were a few tube receivers I completely destroyed as a youth when I didn’t know any better Gareth. Sure wish I could go back in time and save them, though I didn’t have anything as nice as an Eddystone. One of them was my brother’s portable Ever Ready receiver, using miniature tubes (ooops, sorry – valves) which switched on automatically when the lid opened. I tried to fix it, and a few hours later it was in several hundred pieces! It’s good to hear that a few others also have fond memories of the HAC receivers. You have the strongest encouragement from me to build a regen Jon! I’m glad I’m not the only person who remembers (and used to use) the old Ever Ready 90V batteries. I was beginning to feel like an anachronism! Wow. You’re an ARTIST! Beautiful craftsmanship. Excellent work beautifully constructed Reminiscent of the plate wiring we had to do on custom relays set on Post Office Telephones Where do the octal plugs come from though ? I have made a set of similar design designed by Raymond Haigh I believe. Has anode bend type detector and uses D type computer plugs for coil mounting. 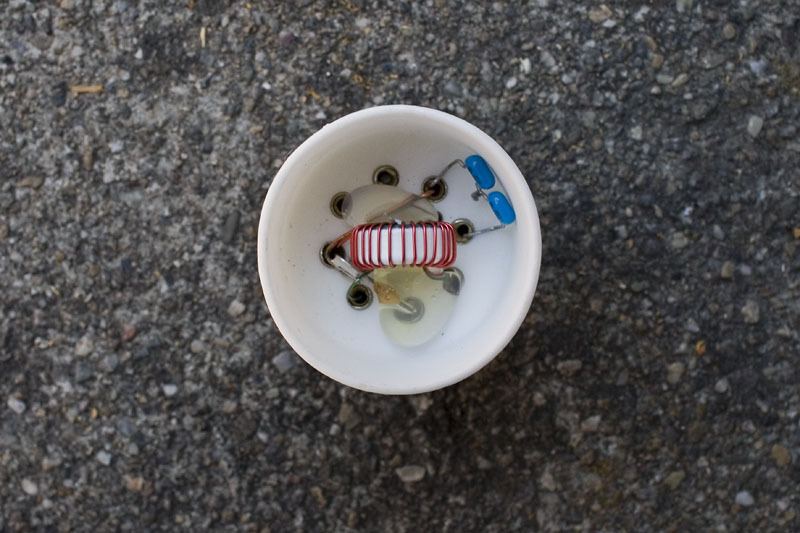 Your plug in coils look far easier to make and solder. D conectors are just to small for my eyes. I will make a sprouty and tell how it compares with Haighs design. 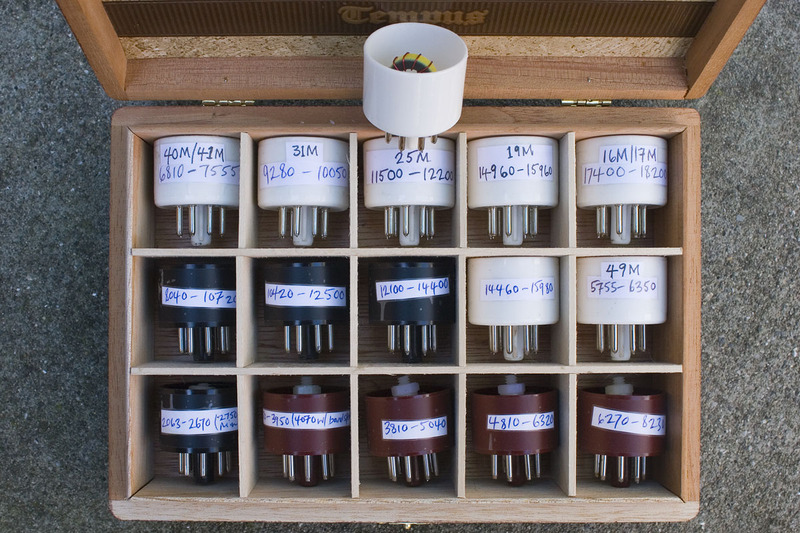 Chris – I got the octal tube bases from Angela Instruments in Annapolis. They have a website and sell on eBay too. 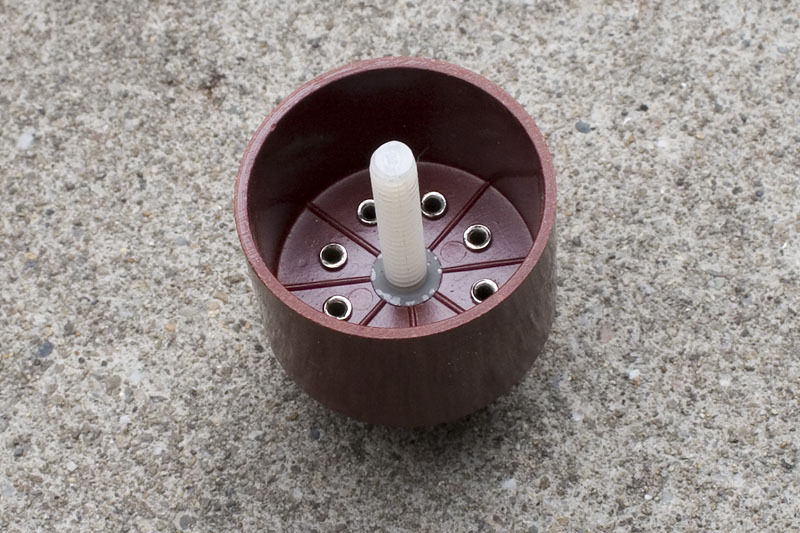 I believe the bases are manufactured in China, and are most likely available from other suppliers too. Got the octal bases Dave, thanks for info. I put a sproutie together using a TDA 7052 as the AF stage. Could not get the RF stage to work so substituted a grounded base circuit pinched from the Raymond Haigh regen which was in an issue of Every Day Practical Electronics. Works pretty well except noise going into oscillation is quite loud and speech in SSB is harsh and not really clear, upper or lower sideband. Any suggestions ? Performance otherwise is similar to Haighs design. Your coils are much easier to assemble than D plugs although getting the desired frequency range requires patience. I really enjoy looking over your site Dave, thanks a lot and many best wishes. Chris – hope you get this, as I’m not sure if the blog is going to register this comment as a reply to your comment. I know the Raymond Haigh circuit of which you speak, though I haven’t built it. 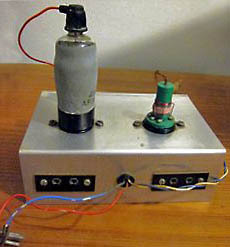 It uses a separate tickler winding, and a variable capacitor for the regeneration control. I’m afraid I don’t have any suggestions, as I have little to no experience with these types of regens. However, you might try reducing the amount of signal that goes into the front end – a variable capacitor should do the trick. Regens overload very easily. A good technique for receiving CW and SSB on them is to turn the AF gain up to maximum, and keep the signal injection low by judicious use of an “RF gain” control. It’s the same way we received SSB on older receivers with diode detectors and BFO’s. Thank you Raducu. I appreciate that! Excellent project. I am wondering about the size of the pcb material you mount the MePads on; both for the Sproutie and the Sproutie II? It’s about 0.06″ thickness. You can get thinner board, but I figured that it helps physical stability, and therefore the frequency stability of the RF board. 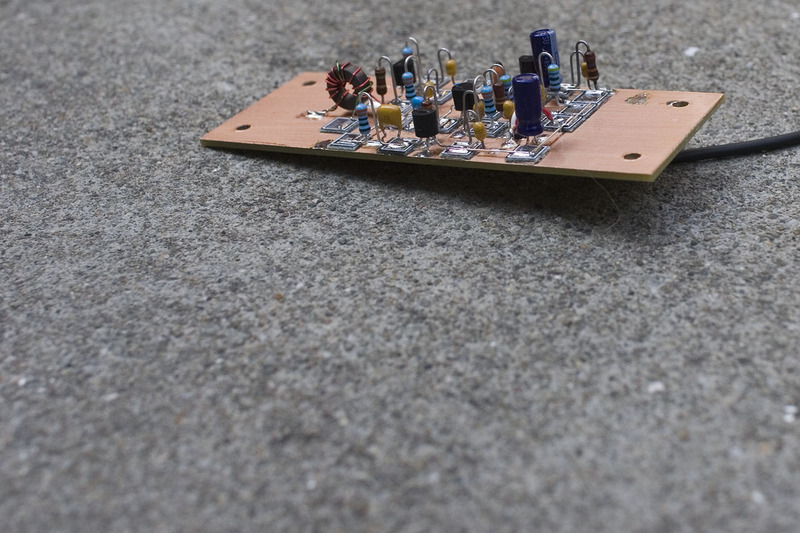 In the Sproutie, the size of my RF board is 1.5″ x 4″ and the AF amp board is 1.75″ x 4″. The sizes I used in the Sproutie MKII were very similar, if not exactly the same. Thanks for that info. It looks like the filter boards are also about the same size? Makes stacking them easier. Starting to gather parts but haven’t decided which one to build. Main hangup is the dial. Ones in good condition are few and far between… and costly. PJ – this blog won’t allow me to reply to your reply. It only allows a maximum of 2 replies to a comment, so I’m posting a new comment here and hoping that you see it. I just turned my Sproutie MK II upside down and measured the boards. They are all 1.75″ x 4″ – the RF board, the main AF board, and all the filter boards. I’m not sure if I mentioned these measurements anywhere in the blog-posts, but it’s very possible that I didn’t, as they are not critical. It’s more a case of picking a size that suits your building style, and ability (or willingness) to fit things into a small space – or not, as the case may be. Dave, Thanks and I did get the info. I have never built using the ‘Manhattan’ style and I do admire the ‘geometric’ layout of your build so I am going to give it a try. I will probably build the original Sproutie as the dial I have better suits that one. I have most of the parts except the octal socket bases. Found them on the net so good to go. Just have to finish a couple other projects first. 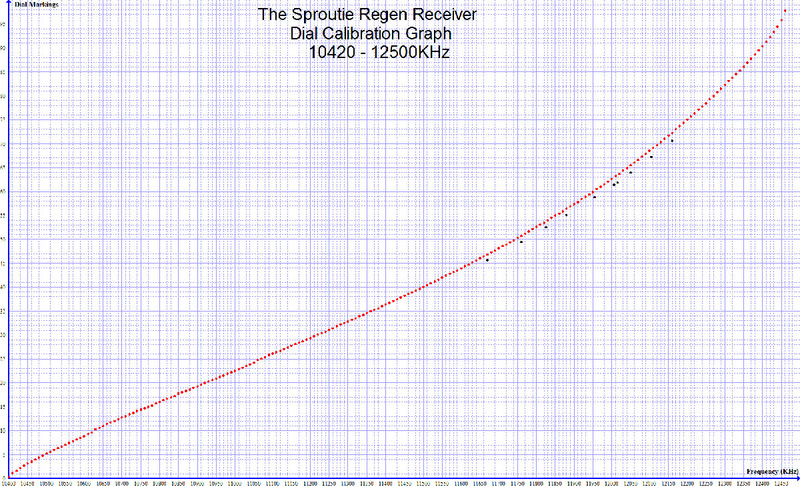 PJ – The schematics of the 2 Sprouties only differ in the audio filtering used. If you find the AD820AN in the original version to be a bit pricey, you can always build just one filter from the Sproutie MK II using the much cheaper 5532 dual op-amp chip. For general listening, I’d recommend one of the 2-stage (4th order) filters, using both op-amps in the 5532 for 3KHz or 4KHz bandwidth. The 3Khz one is a touch narrow for broadcast SW listening, but you’ll be surprised how fast you get used to it, and it does cut down on static well – it’s the filter I use most of the time in mine, somewhat negating the need for the multi-position filter switch. Use whatever dial you want, on whichever version you build. There is no such thing as a definitive version. Best of luck finishing up those other projects! So far the hardest things to find are the variable capacitors. Sat down last night and made up a BOM from the schematics. I will verify it later this afternoon. Thanks for the help and encouragement. Totally identify and I too lusted after an H.A.C. “one-valver” and the awesome “Model K” as advertised in those wonderful 1970s Practical Wireless magazines when I was a young teenager in Scotland. Alas I never received the promised “descriptive catalogue” I sent for, so never got one (I probably couldn’t have afforded one anyway, but we can dream…). Years later, and after a move to Essex (England) for college and work, the shortwave bug bit again and I bought a brand new Sony ICF-SW7600 at a shop in Tottenham Court Road, London. That and a copy of “Passport to World Band Radio” and I was in hog heaven. Wow! HCJB, VOA, Radio Moscow, SRI, YLE, BBC World Service, etc. etc. I later bought a Ukranian Vega Selena “spy radio” too (remember those?). Wow Rob – we had similar beginnings. It’s great to hear from someone who grew up with many of the same cultural radio reference points that I did. My HAC really wasn’t much of a performer – the regens I have built as an adult, such as The Sproutie, are far more impressive. To a teenage boy though, anything you can plug headphones into and hear the world with, is a magic box. That ICF-SW7600 must have made you feel like the king of the shortwave hill! We are lucky to have experienced the SW broadcast bands back when they were still packed with big signals from so many countries. Sometimes, I wish I could bring those days back. Thank you for sharing your memories. I only vaguely remember the Vega brand, and not the Selena model, I’m afraid. Thanks for your response Dave and it looks like you jumped the pond too : ). Yes, last year I bought and got fixed up, a 1962 National NC-140 and although I knew it going in, I was kinda sad that all those wonderful stations that I listened to throughout the 1980s and 90s are no more (HCJB was the XYL and mine’s favorite). Fortunately there are still a few English language shortwave stations on the air, but yes, we were lucky to have lived through some of the glory days of SWL. You would enjoy the book “Listening on the Short Waves 1945 to today”, available on Amazon, etc. I did end up getting my regen though (a Heathkit GR-78 and an MFJ 8100). Amazing performance for 100 year old science. I saw an MFJ8100 at the vintage radio swap meet in Alameda a month or two ago. It looked quite out of place next to the wind-up gramophones and tube table radios of yesteryear. I should have put it out of it’s misery and purchased it, but I’m just a little too good at saving money, so held off! Yes, regens do still amaze with their good performance for such circuit simplicity. Some folk dismiss them as toys, because they have only experienced poorly designed and/or built examples. It’s odd to think that we experienced something which will never happen again, when we were listening to bands full of big SW broadcasters in the past. It’s one of the disquieting aspects of getting older – that we remember things which are no longer a part of our way of life. My grandmother lived to be over 100. I can’t even begin to imagine how she must have felt! Thanks for the book recommendation Rob. I will look out for that. The little MFJ-8100 is fun too but has very touchy regen (unlike the little 1 tube 1-Der 40 QRP transceiver I built and regret selling). It’s missing “medium wave” too. Yes, I once read that when you get to a certain age, you no longer want to live because the world has changed so much ( although my Dad who was old when I told him that and lived to 81 said otherwise ;^) ). Do look up that book as I’m sure you would enjoy it. My eldest brother bought a large Vega portable radio around 1960. It had a thick plastic case and the coils for the various wavebands (6, I think) were switched into circuit in what looked like an all-plastic version of the TV VHF turret tuners that were used then. If you switched to the higher frequency SW bands, it could blank out the TV on 63-66 MHz (UK channel 5). My father owned a hardware shop and sold the large Ever Ready 90V + 1.5V batteries for valve portable receivers. The 1.5V section often ran out before the HT and customers often brought them back to make sure they purchased the correct replacement. We used these old batteries, often two in series, as replacements for the 120V HT Battery in our accumulator powered radio in our bedroom. We got good reception of the BBC on 25 & 31m bands as we were only 15 miles from the transmitter at Rampisham Down in Dorset, South West England. Thank you Rob and Ian, for your great recollections of the Vega receivers. Thank You so much for this. I will save your site and likely make much use of it. I am retired from RF engineering but love the simpler things, especially when a lot of effort goes into a project. It’s the simplicity of regen designs that appeals to me Rodney, combined with the relatively good performance. I’m glad you enjoyed the post, and hope you got something useful out of it. Sometime ago I tried to build a similar little regen set, but it performed poorly. It was built in a similar chassis box as yours, with home made coil forms (octal bases from dead tubes with varnished cardboard tubes). I used a BCB/FM tuning capacitor with 25pf, 365pf, and 140pf sections that could be selected via jumpers in the socket as you did. The vernier dial is one of those 3″ Japanese made types that RatShack sold in the 60’s, I got two of them cheap on ebay, but I also have a National N dial in the junk box. The Jap dial works very nicely and has the vernier scale. I used an old RCA CA3020 ic in the AF stage, it should have as much gain as the LM380 plus the 2n3904 does. I used point to point wiring with transistor sockets, so I can easily rewire the set to use the same circuit that you did in the RF section, and I’d like to try that. Where did you get those NOS octal tube bases? Scharkalvin – those octal tube bases are not NOS – they are actually new. I got them from Angela Instruments in Annapolis, who have a website and sell on eBay too. It’s worth comparing the prices on their site with their eBay prices as, depending on the quantity you purchase, there is a small price difference. Best of luck with your rebuild! Very nice build on the regen Sproutie . Please an you tell me what you use to do your aluminum folding and cutting, do you have a you tube presentation on chassis bashing . I don’t make my own chassis. As mentioned in the post, I used the services of Seaside Chassis.